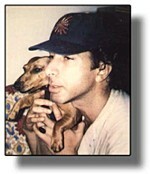 Shortly after the biannual Dachs Fests began in the early '90s, Adrian Milton, the founder, suggested to songwriter Murray Weinstock that he compose a theme song to celebrate their favorite dog. On the eve of the next event Murray discussed the idea with his friend and fellow dachshund owner, Paul de Vries. Given the first line, Paul came up with drafts of the rest of the song, and with Murray's expert musicianship this Dachs Song became a favorite feature of Adrian's wonderful Spring and Fall get-togethers of Dachshund fanciers. On this CD Murray, who has performed with many recording artists and sings with the popular doo-wop group, The Planotones, leads the singing, along with a spirited quartet of professional singers who are credited on the inside cover.